I'm not sure how I didn't discover your blog until now, but wow! It's truly a time warp to see original art from the comics I grew up reading. I'm sure I'm not the first "almost 30-something" to say this, but the Turtles made a huge impact on me when I was a kid. 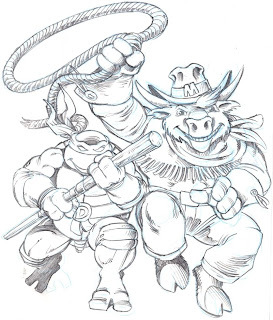 I started drawing right around the time the series hit the airwaves (I was about 9)...and I truly built my drawing chops drawing the Turtles. Day in and day out, throughout most of my childhood. I'm now a cartoonist, working as an animator and illustrator in Boston. I draw my own comics, as well. Again, I'm sure you've been bombarded with fan art, but hey---I thought you might get a kick out of it. I even created my own spin-off comics, as you'll see. So, I just wanted to say a HUGE thanks! 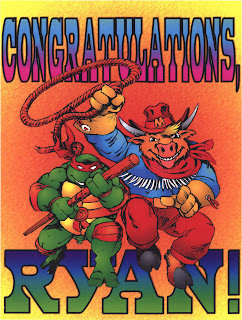 From myself, and my 9-year-old self---so fascinated with the Turtles that I drew them obsessively and eventually became a professional cartoonist. Best wishes (Happy New Year)...and keeping posting! (( a harbinger of things to come as well, this is. Is the new record breaking event going to be held in NY? I'm guessing that is what the Javitz center april appearance will be? Sigh..one more month to wait for all the NYCC announcments :).